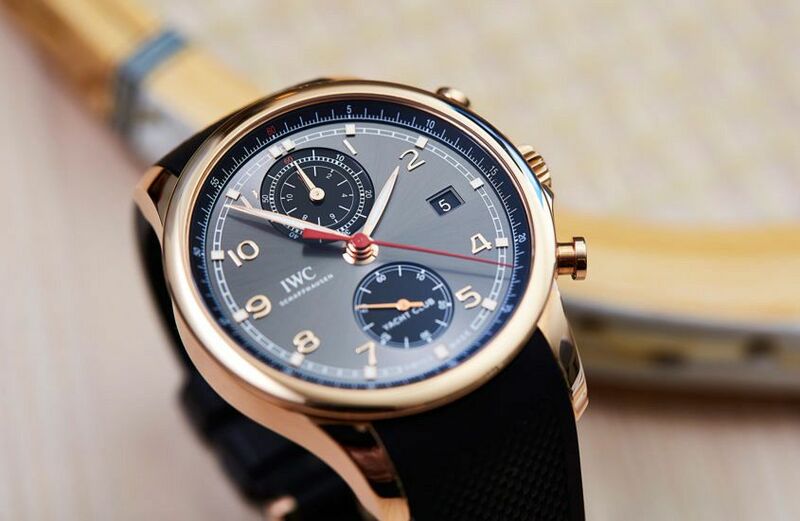 Editor’s note: The Portugieser Yacht Club Chronograph might not be the first watch that comes to mind when you think of IWC (it’s not a Pilot for example), but really, maybe you should change that. Just look at Jason’s snaps from our 2018 review. The story in a second: The sportiest member of the Portugieser family is busy living its best life. 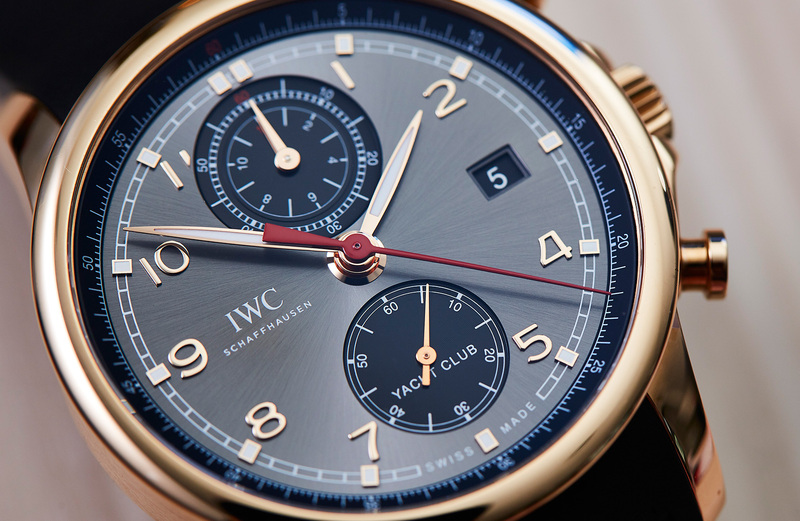 IWC’s Portugieser family is, large diameter aside, a fairly dressy affair. Classic style, leaf hands, all that jazz. It’s the classic business watch. 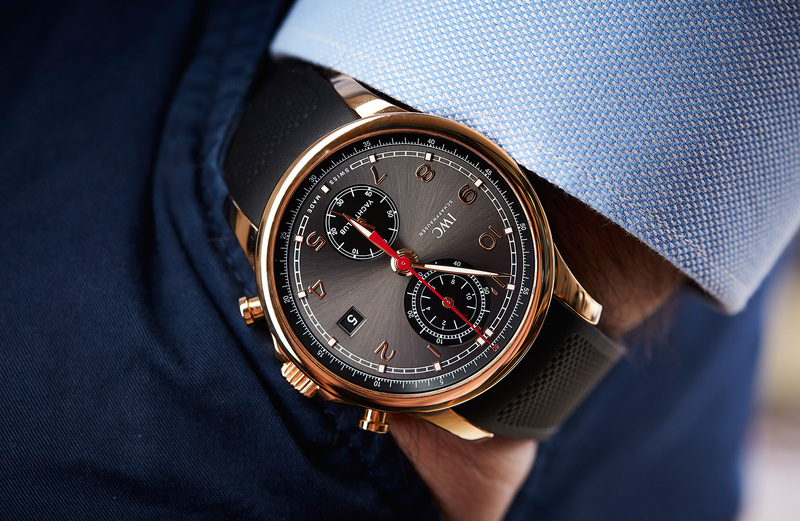 Except, of course, for the Portugieser Yacht Club Chronograph, a watch that is business casual at best. The Yacht Club Chronograph is a timepiece in tune with its fun side, the sort of watch that can transition seamlessly from business to party. And looks great doing it. Slate grey, which is the formal name of this dial, hardly sounds exciting. But the proof, as they say, is in the pudding. This dial is rich in detail and generally stunning. While the base of the dial is a rich slate sunburst, it’s all the other rich details that take it to the next level. The applied golden Arabic numerals, the printed white railroad chapter with luminous dots every hour, the deep black chronograph registers, and the classic leaf-shaped hands, which are — unusually for a Portugieser — filled with luminous material. I’m also quite partial to that red chronograph seconds hand, though I’d happily do without the ‘Yacht Club’ text at six. But as far as dial text goes, it’s not too bad. The case is, to paraphrase Mike Myers, solid (red) gold. It’s generously sized at 43.5mm across and 14.2mm high — on the larger side, but not too big, especially for a sporty chronograph like this. It’s also got all the classic Portugieser hallmarks: the simple bezel, distinctive angled lugs and pump-style chronograph pushers. It’s a strong look. What’s unusual here is the slight crown guard — a nod to the watch’s sporty design, just like the lume-filled hands. It should come as no surprise that IWC excels in making big, beautiful and robust movements, and the calibre 89361, on show through the rear, is no exception, if high-end industrial watch finishing is the sort of thing you’re into. Looks aside, there’s plenty of interest on the technical sides of this calibre; it’s a vertical clutch column wheel — an accurate and reliable implementation of the chronograph complication. I also quite like how IWC has designed this movement, with stacked hours and minutes totalisers in the top subdial and running seconds below. The result is a full function 12-hour chrono that maintains a clean aesthetic. My list of watches on rubber straps that look good with a suit is a very short one, but this watch is on it. 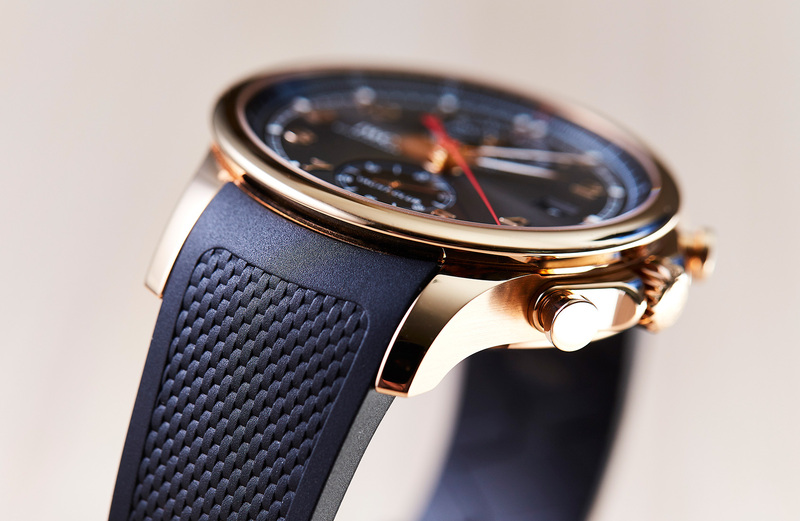 The rubber strap, with its fabric-like printed texture, is a classy option, perfectly in keeping with the polished, upper-class looks of the Yacht Club Chronograph. However, it’s also a very functional strap, exactly the sort of hard-wearing, weatherproof strap you’d want to have if you were a member of an actual Yacht Club. In short — great. This is a Fun watch to wear, with a capital F. There’s an opulence and extravagance to a gold sports watch that translates to a real joy on the wrist. This is no tool watch, maintaining a veneer of utilitarian purpose. This is a luxury sports watch, and a great example of the genre. 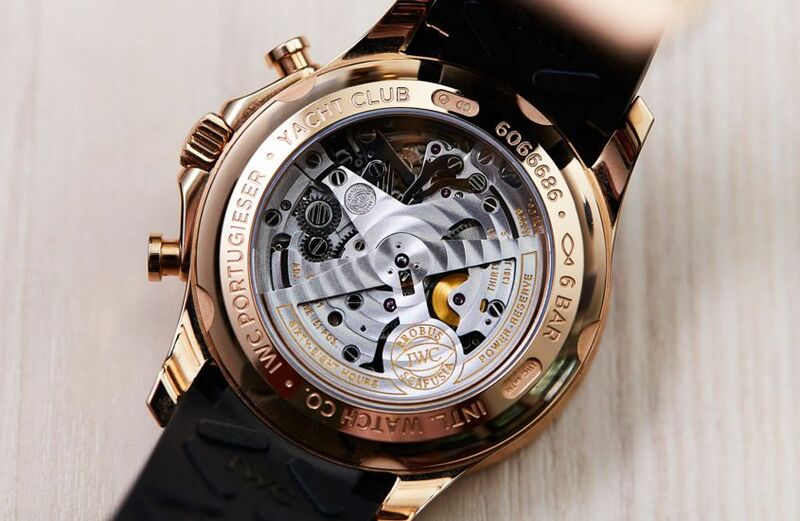 It’s a Portugieser, but not as you know it. Fun, sporty and packed full of gorgeous details. 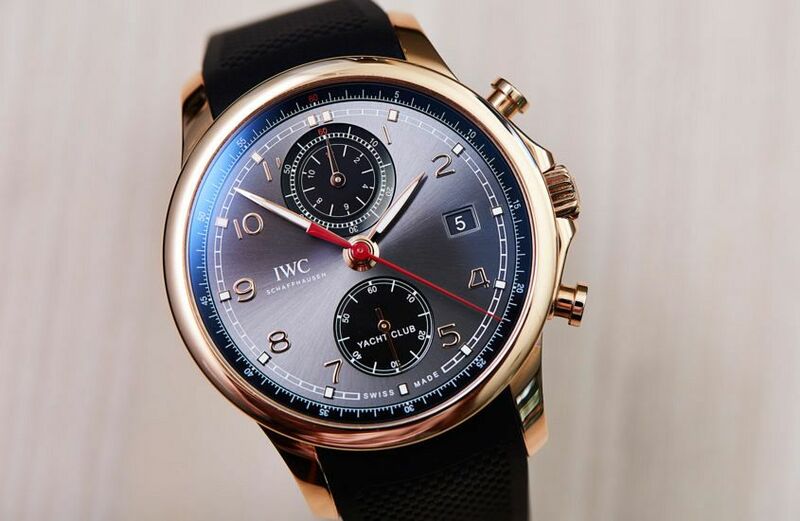 The IWC Portugieser Yacht Club Chronograph is a winner of a watch. People who like taking smart casual to the next level. 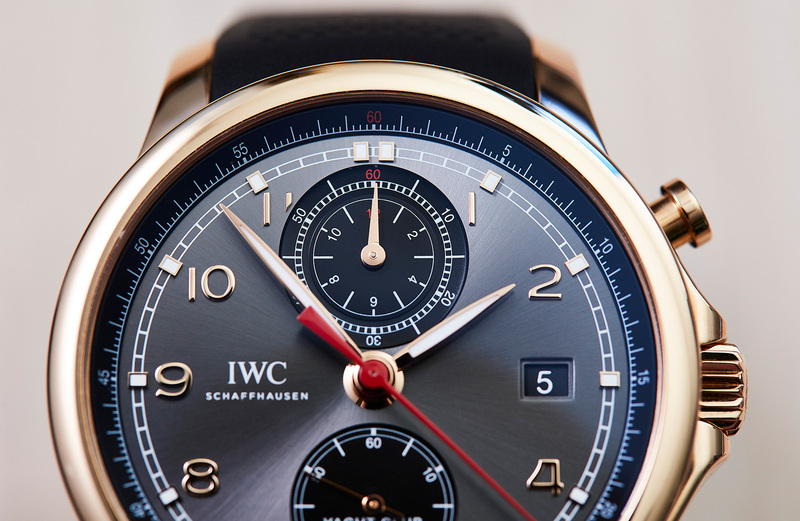 It would be nice to see some of IWC’s latest movement tech (ceramic components, etc.) in this watch — but it’s not a deal-breaker.